About that California State of Mind and about its counterpoint, melancholy. I visit it in California also. Now and then, when there’s a lot of ‘future’ in a place or a day or even a conversation, I’m reminded that I do not have that luxury called future—that time-ahead. Oh of course there’s some—and I’m eagerly planning it—but…well…there is an obvious sell-by date attached to any and all dreams of 78-year-olds! Yesterday, young California was all about me: a million late model cars racing into later in the day/week/month/year; children and grandchildren chatting casually about bright adventures ahead; exuberant art in contemporary buildings and photo-op food. California makes us believe that there’s a future but, while we elders are reassured by that on behalf of our descendants, it’s impossible not to be a little melancholy about our future non-participation. That said, yesterday was an exceptionally nice day. My son is most solicitous on my visits—anxious that I be entertained, fed nicely, catered to in multiple ways big and small. Yesterday represents the ultimate sacrifice, putting a Californian on the LA freeways when he didn’t actually have to be there—and being impressed by his good humor throughout. Watts Tower, MOCA, and a patio lunch with very nice food and even nicer wine. Only one winy lunch to go before Albuquerque and thirty days without (my new lifestyle plan, doing well so far, takes me off a favorite, but potentially unhealthy ingestible item for 30 days at a time; wine is scheduled for April/May, then sweets and, when I’m brave enough, coffee—by which time I’ll be able to drink wine again—see how that works). But I digress…a lot this morning it seems. For some reason I feel discombobulated right now…distracted…disengaged…dis-something. This is really a photo album from yesterday: Google Watts Towers for the story of these unique structures, these magical art towers, in what has long been considered a most unmagical neighborhood. 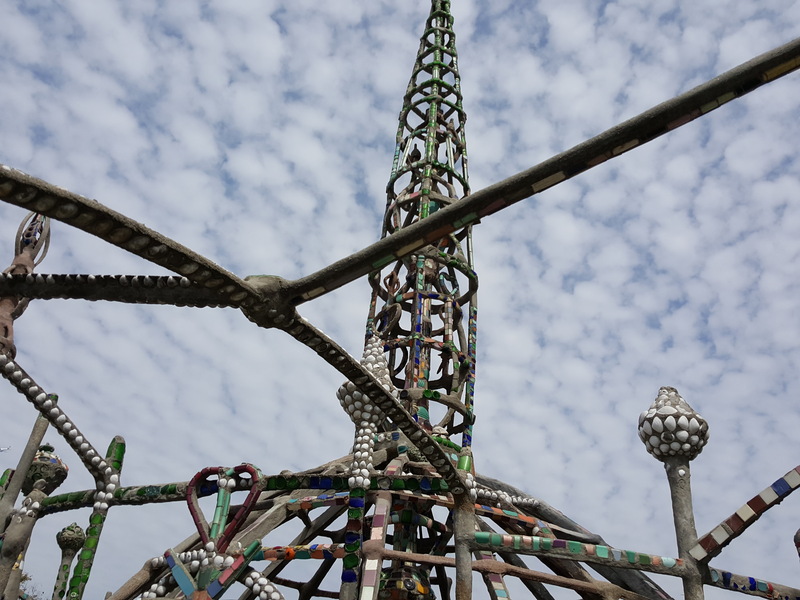 For 34 years, an Italian immigrant laborer, craftsman and artist named Simon Rodia, worked night and day (when not at his day job) to create the Watts Towers. Thirty four years. Then he gave them away, left town, rested, and died. How come our dancey little La La Land artists didn’t visit here with a dance tribute to fortitude, determination, Art, and the future? The future indeed does belong to younger folks, but we can still play. They say wisdom comes with age….I think it is realization comes with age….we realize we are rocketing toward the great dirt nap. I think that makes us more pensive and less reactionary. I think the towers are a testament to a man who knew what he wanted to accomplish and he accomplished it. That is a very good thing.